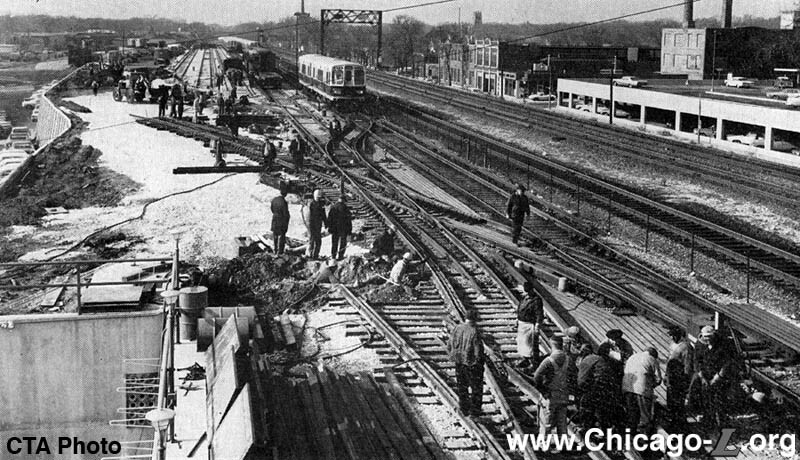 When the Lake Street Elevated was extended from Wisconsin station in Oak Park to Forest Park station at Circle and Marengo avenues on Chicago & North Western Railroad property in the station's namesake suburb on May 20, 1910, only one track initially crossed Harlem Avenue to serve the platform. Later, a second track and new buildings were added, but the station was always lightly used and there was never a yard or shop here, only two stub tracks. 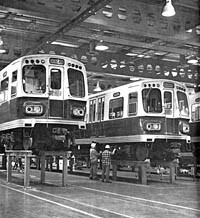 The Lake Street Elevated's storage yard and car maintenance facility were at Hamlin Avenue on the West Side of Chicago at a facility various called Hamlin Shops, Avers Shops, Springfield Shops, and simply "the carhouse" over the years. When the CTA elevated the suburban Lake Street "L" tracks in 1962, the Forest Park station (along with all the rest of the grade-level stations) was demolished. Instead of the rebuilding Forest Park and the Wisconsin (now called Marion) stations, one new station was built at Harlem as the line's terminal. A new elevated yard and shop were to be built west of the station. Harlem Yard now the site of the former Forest Park station. Construction of the new yard and maintenance facility at Harlem in Forest Park was concurrent with the elevation project. The 'yard' at Harlem was initially just a few tracks continuing west of the Harlem/Lake terminal, but expansion of Harlem Yard to the point where it was storing the bulk of the cars assigned to Lake Street was pretty much complete by December of 1963. However, construction of the shop and further expansion of the yard at Harlem took a little longer. The contract for the construction of a Transportation Building and substation in the east end of the yard, at the corner of Harlem and Circle adjacent to the Harlem station, was awarded on September 5, 1963. The two-story building was 85 feet by 53 feet and projected to cost $244,000. 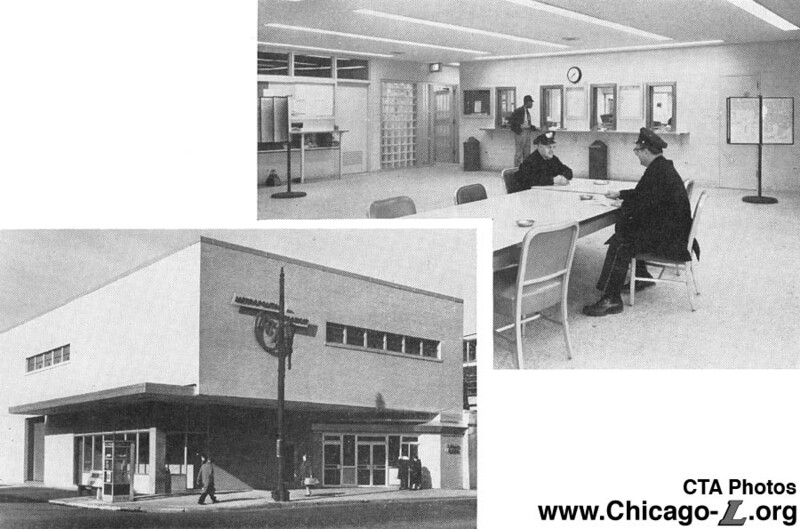 The substation and Transportation Office, housing a breakroom, lockers, and restrooms for operating personnel, offices, and clerks, were completed and placed in service on December 6, 1964. The building was clad in tan face brick and perhaps its most identifiable feature is a large stainless steel CTA logo, complete with "METROPOLITAN TRANSIT" banner, on the building's east elevation. On the same date, the storage of the major portion of cars assigned to the Lake Line was transferred from Hamlin to Harlem following an expansion of the yard to accommodate a total of 86 cars. This also ending the need to store cars on the Lake Street center track between Rockwell and Pulaski. But there was still no shop and insufficient room of the line's entire roster. Additional space was left to the west of the yard for additional tracks and a shop. Although cars were now being stored at Harlem Yard, some cars were still stored at Hamlin Yard. In 1965, four additional tracks totaling 0.43 miles were laid in Harlem Yard. On July 5, 1966, overnight lay-ups at Hamlin Yard were eliminated. Henceforth, all car storage was at Harlem Yard. Work also began on a new inspection shop at the west end of the yard. By March of 1966, there had been significant progress on the shops and by the end of the year the facility was nearing completion. The shop, with a floor area of 25,000 square feet, is a two-story building with a structural steel frame clad in tan concrete face brick. Repair activities are concentrated on the second floor, which is at the level of the elevated yard. The shop can accommodate as many as 12 cars in five bays all of which face east: the northernmost (Track A) is able to accommodate four cars inside the shop and the remaining four (Tracks B through E) can accommodate two cars inside the shop. Three hoists, each capable of lifting a 2-car train five feet in the air off the tracks, provide easy access to the undercarriage of the cars. One of them is also equipped with stands that can support the train in an elevated position while one or all of a car's trucks are lowered and removed. A two-car pit track is provided for regular inspection and servicing of cars. A second pit track on Track A is in an adjoining structure and includes a high-pressure blow pit device for cleaning car undersides and a wheel grinder for surfacing wheel treads without necessitating their removal from cars. Harlem Shops was specially designed to provide a centralized facility for the maintenance and repair of air conditioning-equipped rail cars. 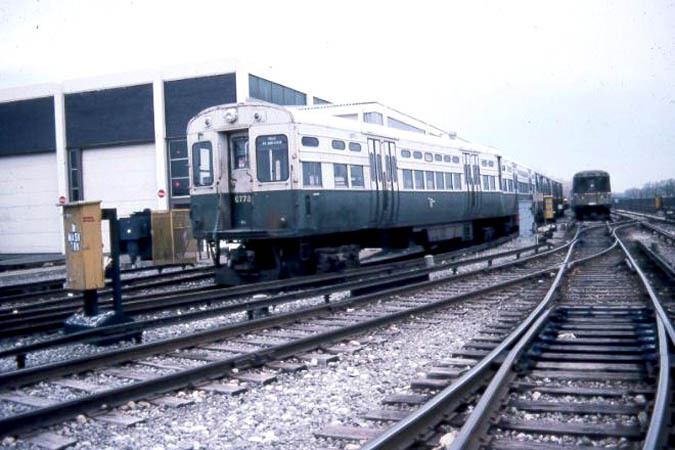 At the time, the CTA had taken delivery of the first series of cars air conditioning -- the Pullman-Standard 2000-series cars -- 140 out of a total of 180 of which were assigned to the Lake Line. The Harlem Shop was completed and placed in service on June 19, 1967. 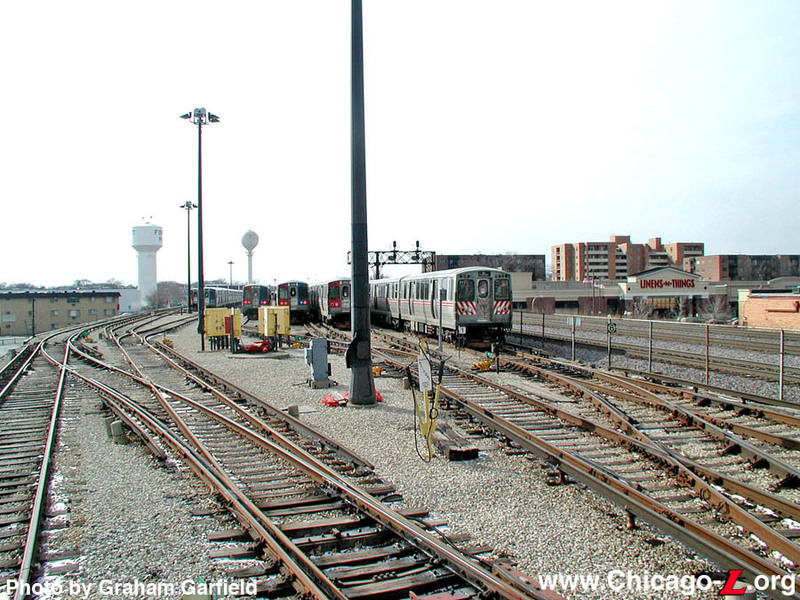 Harlem Yard is a long, narrow yard, stretching roughly 0.3 miles from Harlem Avenue westward, parallel and adjacent to the Chicago & North Western Railroad (now the Union Pacific). The yard is nine tracks wide, with the Tracks 1 through 8 (from north to south) being storage tracks. A ninth track (Track 9, natch) skirts the south perimeter of the yard and leads to the shop at the west end of the yard. The yard has a capacity of 130 cars (excluding shop tracks and Track 9, the shop lead). A car washer is located on Track 8, just east of and in front of the shops. Harlem Yard was removed from service in January 1994 when the Green Line was closed for a two-year rehabilitation. 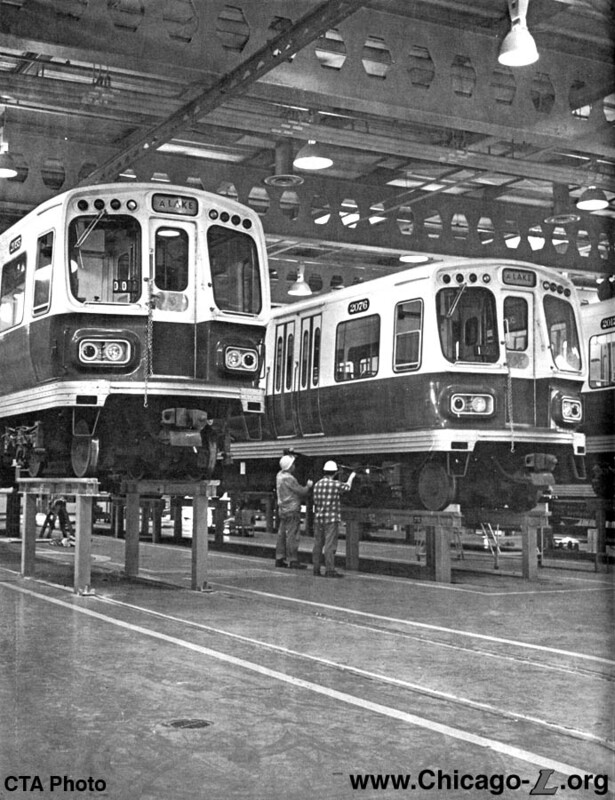 During its closure and isolation from the system, the CTA stored some of their historic cars were -- SSRT car 1 and Heritage Cars 1892-1992 (2007-08) -- as well as several 5-50 series cars. 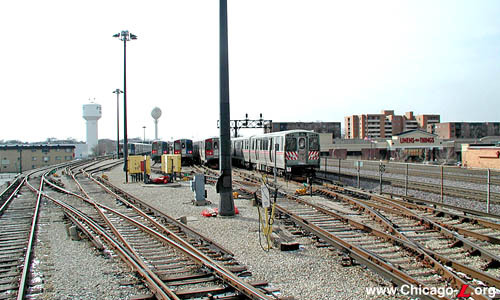 Following the completion of the Green Line rehab, Harlem Yard was reenergized at 1800 hours on February 23, 1996. On February 27, 1996, the entire Lake branch from Tower #18 to Harlem Yard was returned to nonrevenue service at 1800 hours. 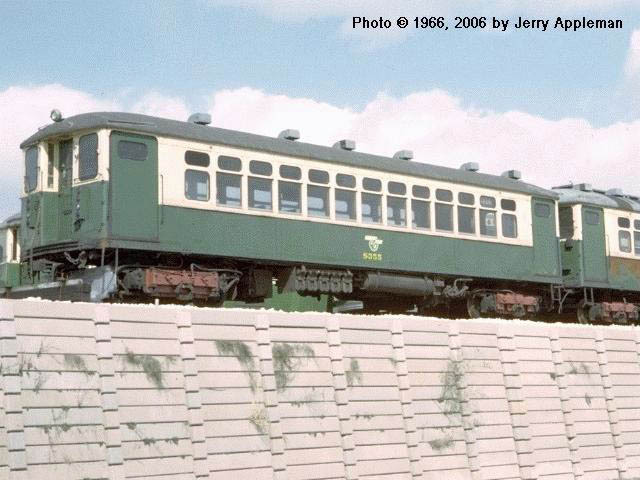 The Green Line resumed service on May 12, 1996.